Joining a Chamber committee and attending events are both outstanding ways to expand your business network and elevate your company’s public profile. 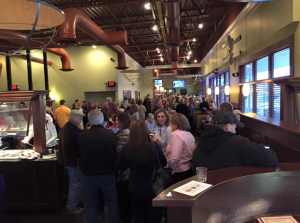 Hosted by Chamber members, each event takes place the third Thursday of each month from 5 to 7 p.m. These casual, popular get-togethers feature food, drink, door prizes and priceless networking opportunities. A gala affair with cocktails, dinner and a program where annual business awards (voted on by the membership) are announced and presented. Other opportunities to network with fellow Chamber members happen throughout the year, so be sure to read our e-mail newsletters for details. 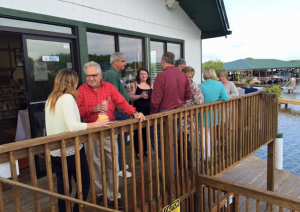 To get involved or volunteer for any Chamber event, contact Event Manager Andrea Fansler at 540-721-1203 or andrea@visitsmithmountainlake.com. For details on when the committees listed below meet and how to join, contact Laura Moritz, Community Relations Director, at 540-721-1203 or lmoritz@visitsmithmountainlake.com. The Council is comprised of 12 Chamber members who recognize the value of business-to-business networking and community building. Ambassadors help organize networking events, such as the monthly Business Before Hours / Business After Hours, ribbon cuttings and other Chamber events. They assist with membership retention, welcome new businesses, oversee a group of members, and maintain a visible presence at community and Chamber functions. This committee, which meets monthly, submits recommendations to the Executive Board and Board of Directors regarding seminars and educational programs that would provide value to the membership. The committee organizes and conducts approved educational programs. Additionally, the committee makes members aware of appropriate educational opportunities in the community. The Government Affairs Committee tracks local, state and federal legislative, policy and regulatory issues that affect local businesses; develops and recommends to the Board advocacy positions on those issues; and communicates the Chamber’s viewpoint clearly to our membership, elected officials and the community at large. The Committee meets on the first Tuesday of the month, 9:30-10:30 a.m. The committee is open to any SMLRCC member. 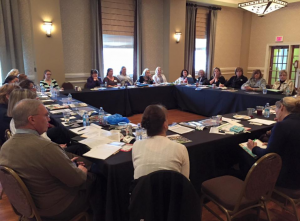 The Marketing Committee provides input and assists with marketing and promoting the Chamber and its annual events. Chamber marketing methods and tools, both traditional and online media, are addressed to further the mission of the Chamber, promote Smith Mountain Lake, increase visibility of membership benefits, and all Chamber events. This group meets monthly. Member representatives with marketing expertise are encouraged to join this committee. This committee delivers programs and activities that will increase Chamber membership and provide value-added to existing members. The goal is to grow membership and strengthen the organization by ensuring that member needs and expectations are fully met. This includes reviewing membership guidelines, evaluating the need for networking and ensuring effective communications to the membership. The Nominating Committee is comprised of three to four Chamber Board members who are familiar with the organization’s operations and requirements for a Board position. Members are appointed by the Board in April to nominate candidates to fill vacancies beginning the following year.